Ann Marie first volunteered for Stream Team in 1998 watering trees at Pioneer Park while working on her Masters of Environmental Studies degree at The Evergreen State College. This led to an internship at the City of Tumwater and later a permanent position. 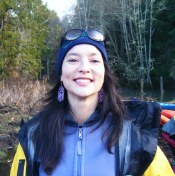 After leaving Stream Team for a few years to work for the Nisqually Tribe on salmon habitat restoration issues, she returned to Stream Team in 2006. She has worked happily at Thurston County ever since then, and is glad to work closer to home now that she has two young sons and a wonderful husband. Her family enjoys planting trees and learning about salmon, marine creatures and most any other family-friendly activity that Stream Team sponsors!